I love Jute and to recycle anything possible. Having length of Jute twines at home made me to think of recycling a can into a vase. These cans were lying with me when we bought Fastrack watches last year. Its super easy and only takes less than an hour. 1. I started from the base of the can and worked way up to the top. 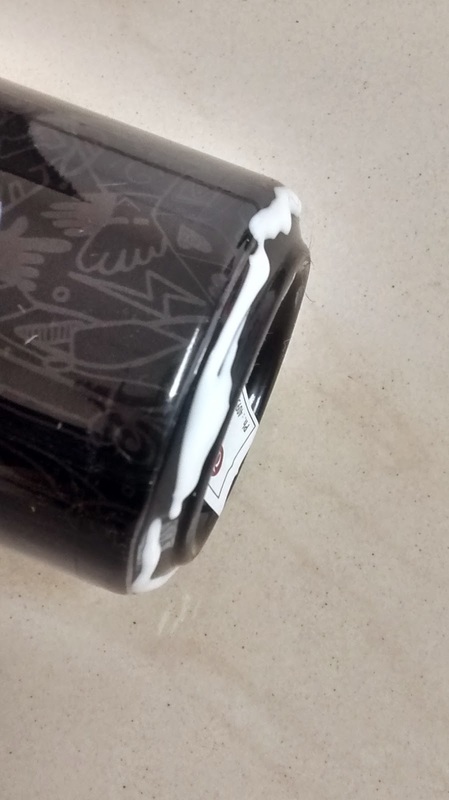 Apply thick line of glue to the base/bottom of the can. Start sticking the jute twine. After sticking one round around the can, wait for five minutes for the glue to dry. 2. 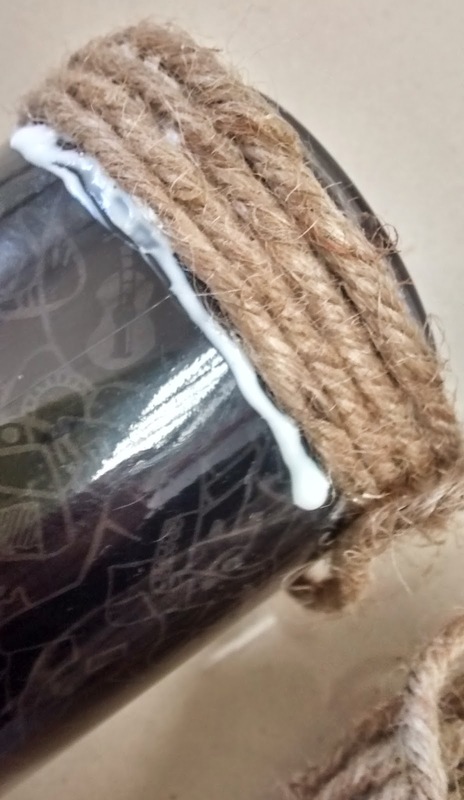 Apply glue in a thick line around the can and stick the twine close together. There should not be any gap. 3. 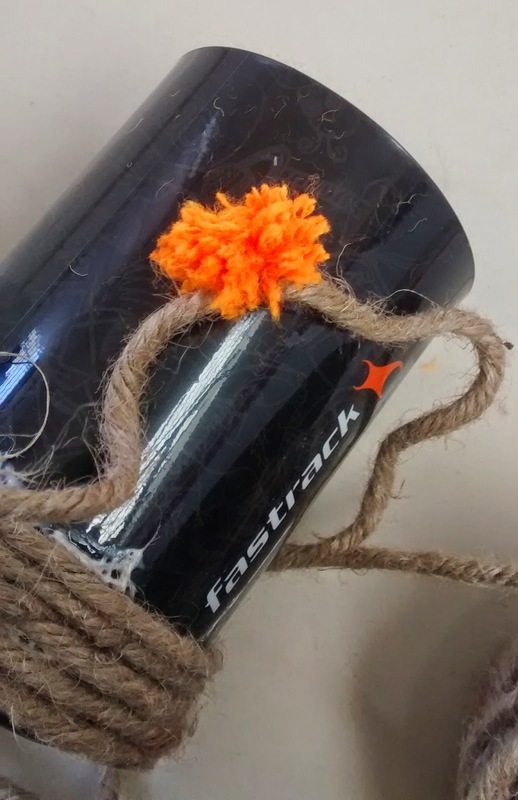 After a couple of rounds of sticking, stich the pom pom to the twine and continue gluing and sticking. 4. Stich the pom pom at required interval and continue sticking,gluing till you reach the top. 5. Voila!! You are done.. 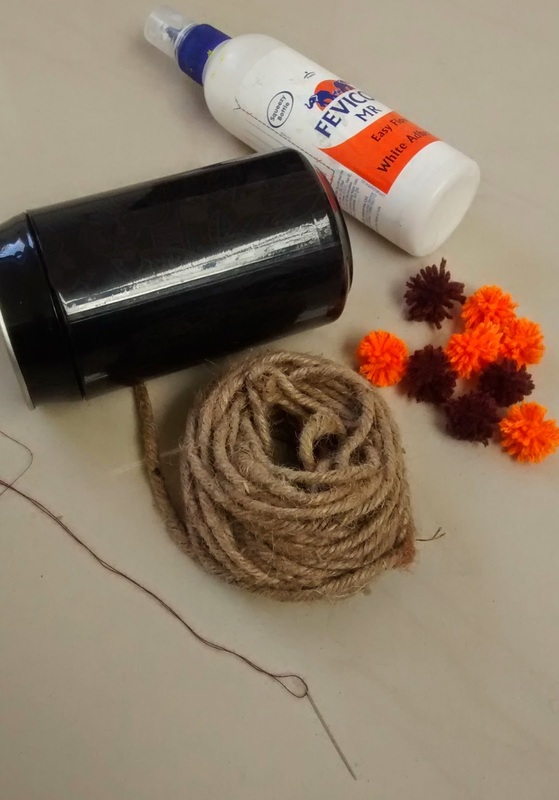 I used pom pom because they are easy to create. You can try sticking other things like felt flowers, paper flowers, buttons or beads onto jute. Since Jute and the color green make an excellent pair, I took a small bottle and placed some leaves and plants..
Love the pom pom and the jute. Very creative. Between that cute little drawer set u have.. looks so so pretty. Nice one...i like textured vases with green plants. Vasudha, The jute goes so well with your décor. I love the pom pom that you added. Great idea Vasudha. Lends a unique appeal with those colourful pompoms! Great Idea Vasudha. The pompoms lend a unique appeal too! This is so pretty! love it really!! Very creative way to recycle. Looks great. I have been using burlap cloth for the same purpose but this jute twines wins out for more authentic look. Is it really this simple to make.. Looks lovely.. Im going to try this with twine as well..